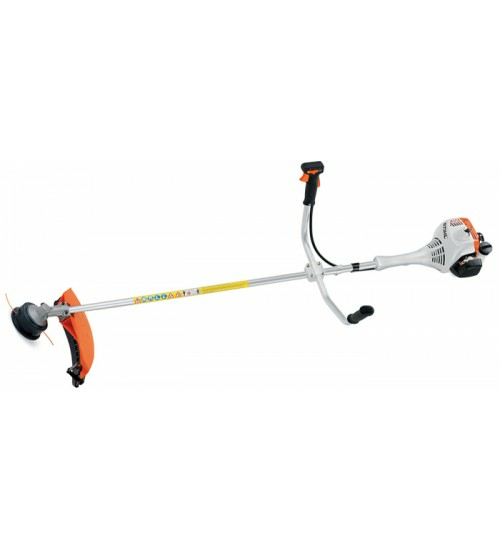 Low weight compact brushcutter, with fully adjustable bike handle. Practical control handle with integral throttle trigger and slide control run/stop selector. Comes standard with AutoCut line head. Steep meadow or embankment, tough grass, undergrowth or bush work: STIHL brush cutters and clearing saws are made to the highest standards, to perform a wide variety of tasks in difficult areas. Depending on the output of the engine and the cutting tool being used, brush cutters are suitable for jobs ranging from thinning out and mowing of grassed areas to thorough clearing of scrub. Powerful STIHL clearing saws are particularly useful for professional work in farming and forestry management. The STIHL brush cutter range offers the right option for every need, for every requirement, for everyone. One hand keeps a firm grip on all operating elements for controlling the machine - for safe and reliable operation. The decompression system increases the time the intake valve is open. This considerably reduces the effort needed to pull the rope. Allows long intervals between cleaning and provides reliable engine protection. shoulders, back and hips, with soft padding, for prolonged working on large areas. * Bike handle - When used in conjunction with a harness, the bike handle enables a smooth, uniform mowing action when working on large areas and allows the machine to be guided easily, reducing fatigue.